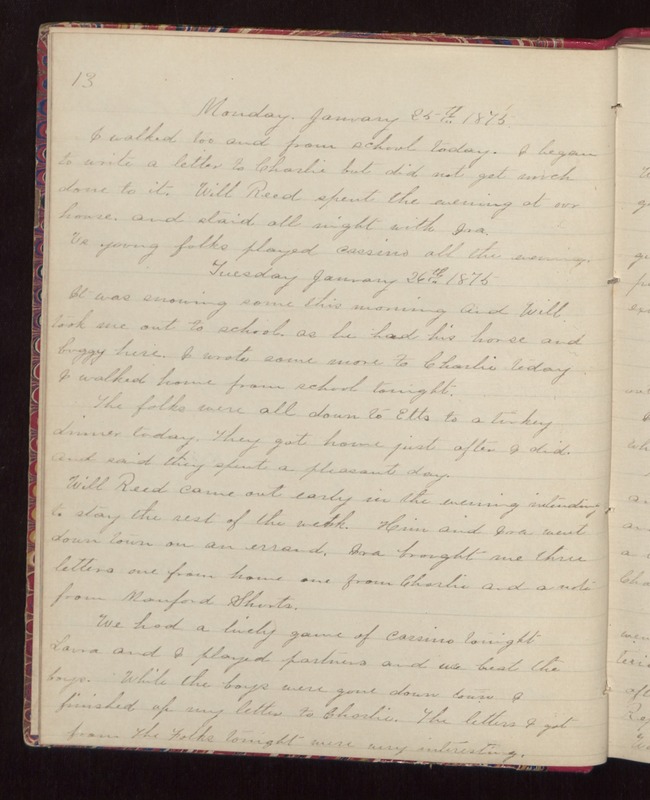 Monday, January 25th 1875 I walked to and from school today. I began to write a letter to Charlie but did not get much done to it. Will Reed spent the evening at our house. and staid all night with Ira. Us young folks played cassino all the evening. Tuesday January 26th 1875 It was snowing some this morning and Will took me out to school as he had his horse and buggy here. I wrote some more to Charlie today. I walked home from school tonight. The folks were all down to Etts to a turkey dinner today. They got home just after I did and said they spent a pleasant day. Will Reed came out early in the evening intending to stay the rest of the week. Him and Ira went down town on an errand. Ira brought me three letters one from home one from Charlie and a note from Manford Shirts. We had a lively game of cassino tonight Laura and I played partners and we beat the boys. While the boys were gone down town I finished up my letter to Charlie. The letters I got from the folks tonight were very interesting.